With its contemporary style, curved lines and legendary cooking performance, the Lodge 14" Cast Iron Wok is an over-sized vessel that is the perfect size for cooking generous amounts of your favorite stir-fry recipes. The cast iron properties of this wok provide superior heat retention and allows for even heating throughout, ensuring your food is properly cooked. Designed with two assist loop handles which offer a safe, secure grip. The unique flat bottom allows you to use an electric or gas range without a ring to hold the wok steady as it transfers the heat rapidly from the burner to the wok. 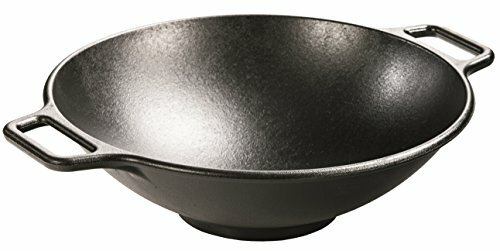 If you like to deep fry, this wok will run circles around most any cookware and requires less oil. Proudly made in the USA since 1896. Lodge proudly continues the legacy which began more than a century ago with Joseph Lodge. Cast iron is economical and durable. Seasoned for a natural, easy-release finish that improves with use. Seasoning is a necessary step in using cast iron cookware. Oil is baked into the pores of the iron at the foundry to prevent rusting and to eventually provide a natural, non-stick cooking surface. After cooking, clean wok with a stiff nylon brush and hot water. Using soap is not recommended, and harsh detergents should never be used. Avoid putting hot cast iron into cold water. Thermal shock can occur causing the metal to warp or crack. If you are having trouble removing stuck-on food, boil some water in your wok for a few minutes to loosen residue, making it easier to remove. Towel dry immediately and apply a light coating of oil to the wok while it is still warm. Store in a cool, dry place. Product weight: 11.86 lbs. Care Instructions : Hand wash. Dry immediately—even before first use.Rub with a light coat of vegetable oil after every wash. How much oil? Enough to restore the sheen, without being “sticky”. Why? To keep the iron “seasoned” and protected from moisture. 14 Inch Seasoned Cast Iron Wok. The Lodge Cast Iron Wok weighs 11.86 lbs and is made of 100% cast iron, which retains heat better than other metals and makes for short work of everything from a stir fry to a summer vegetable sauté. The flattened bottom is ideal for all cooking surfaces, including induction.